A., A., Hojati Fahim, M., Nikomanzari, E. (2015). The Effect of Chloride Ions Concentration on the Electrochemical Behavior of AISI 410 Stainless Steels in Simulated Concrete Pore Solution. International Journal of Iron & Steel Society of Iran, 11(1), 35-40. A. A.; M. Hojati Fahim; E. Nikomanzari. "The Effect of Chloride Ions Concentration on the Electrochemical Behavior of AISI 410 Stainless Steels in Simulated Concrete Pore Solution". 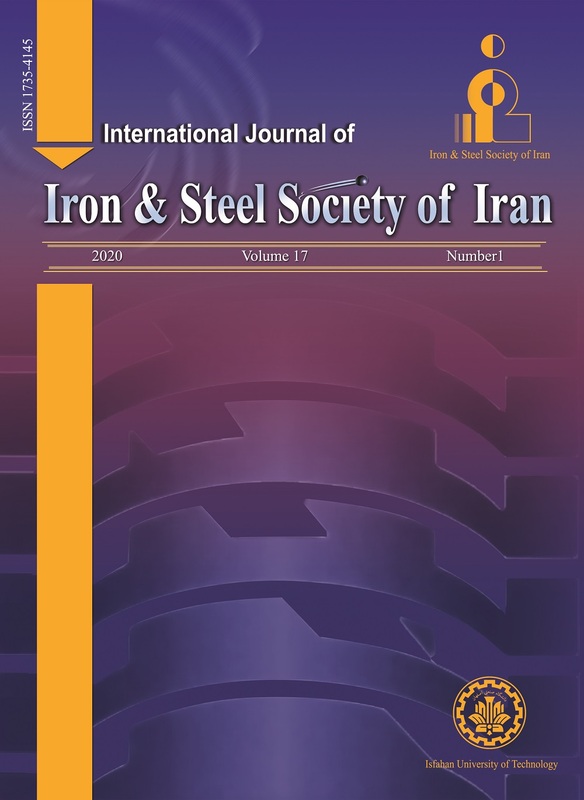 International Journal of Iron & Steel Society of Iran, 11, 1, 2015, 35-40. A., A., Hojati Fahim, M., Nikomanzari, E. (2015). 'The Effect of Chloride Ions Concentration on the Electrochemical Behavior of AISI 410 Stainless Steels in Simulated Concrete Pore Solution', International Journal of Iron & Steel Society of Iran, 11(1), pp. 35-40. A., A., Hojati Fahim, M., Nikomanzari, E. The Effect of Chloride Ions Concentration on the Electrochemical Behavior of AISI 410 Stainless Steels in Simulated Concrete Pore Solution. International Journal of Iron & Steel Society of Iran, 2015; 11(1): 35-40. The effect of chloride ions concentration on the electrochemical behavior of AISI 410 stainless steel in the simulated concrete pore (0.1 M NaOH + 0.1 M KOH) solution was investigated by various electrochemical methods such as Potentiodynamic polarization, Mott–Schottky analysis and electrochemical impedance spectroscopy (EIS). Potentiodynamic polarization curves revealed that increasing chloride ions concentration led to decreasing the corrosion and pitting potentials of AISI 410 stainless steel. Mott– Schottky analysis demonstrated that passive films formed on AISI 410 stainless steel in the simulated concrete pore solution with and without NaCl addition showed some n-type semiconducting behavior in nature. Moreover, Mott–Schottky results showed that the donor density was increased by increasing chloride ions concentration. EIS revealed that in the absence of chloride ions, the surface films formed on AISI 410 stainless steel in the simulated concrete pore showed higher passive film and charge transfer resistance. However, in the presence of chloride ions, an inversion of this trend was observed.